From an early age Carolyn Dougherty was interested in the paranormal. As an adult she has spent much of her life exploring ghost stories and claims of haunting. In her presentation for CNY Skeptics she will talk about her journey from believing to applying critical thinking to investigations. Carolyn Dougherty was a writer and assistant editor for MyPara Paranormal Magazine, a writer for The Bent Spoon Magazine, and is the author of the book Creepy Corners: Searching for Truth in Paranormal Claims. 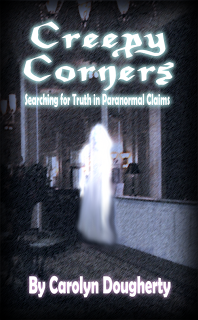 She is the writer of Carolyn’s Creepy Corner, a blog promoting critical thinking in paranormal research. Dougherty earned a BA in music and English from The University of the Pacific and taught language arts for many years.